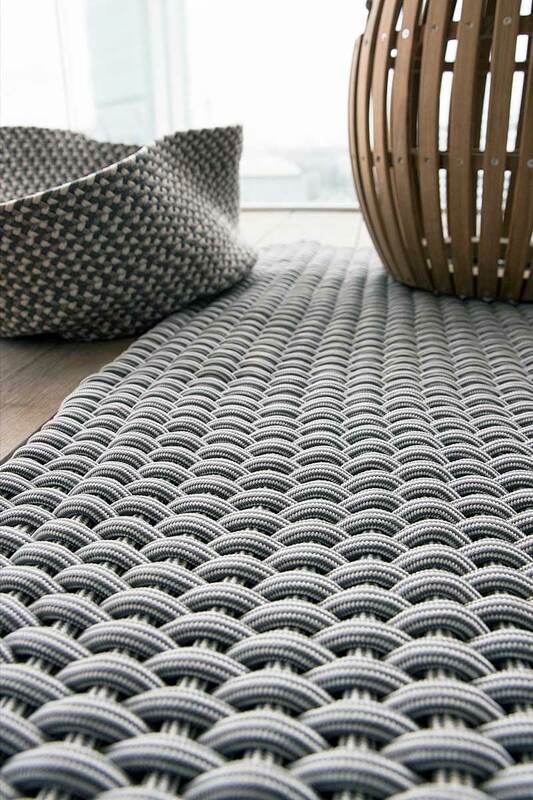 Baku is a collection of 100% Italian patented carpets in synthetic techno fibre. They are hand-woven and available in various types of weave, size and colour. Unique, practical, light and attractive they can be used in a wide variety of situations to give tasteful originality and a touch of irony to any ambience. Their technical characteristics make them perfect and ideally suited to outdoor use, for which they were especially developed and designed. They are quite obviously also ideal for indoor furnishing as well. Baku carpets are made with a new polyolefin fibre patented in Italy for outdoor use: 100% non toxic, mould, bacteria, damp, chlorine and stain proof and do not fade. They are suited to any skin type, even the most delicate of the newborn baby. This is an incredibly light fibre and is unique in that it floats. It remains unchanged even after years of washing, does not absorb any dirt or odour, can be washed at 40⁰ using little detergent, needs no ironing and dries in 5 minutes. Baku carpets are ideal for a wide variety of use and sectors : contract, residential, nautical, spa, catering, outdoor/indoor, etc., Baku carpet fibre is environment friendly: 100% recyclable, requires little energy for cleaning, is durable and easy to use. It is Certified Oeko-Tex Standard 100, class 1. The carpets are available in two types of weave (braided and panama) three shapes and sizes: square (300 x 300 cm), rectangular (200 x 300 cm) and round (140 cm, 200 cm diameter). Colours: Blue Grey, Natural mix, Beige, Mauve, Olive Green, Ivory, Ivory Grey, Green beige.